Paris has been forging a reputation recently for battling urban air pollution, and now they’re considering a 1,350-hectare suburban forest. The Syndicat Mixte d’Aménagement de la Plaine de Pierrelaye-Bessancourt (SMAPP) project could create a forest five times the size of New York City’s Central Park, around 18 miles northwest of the center of Paris. Business Insider said the location is currently a wasteland, serving as an unofficial landfill, but the SMAPP plan would transform the area into a lush space with hiking trails, conservation areas, and almost one million trees. Paris sprayed sewage residue on the fields of Pierrelaye-Bessancourt from 1896 to the 1990’s, according to Business Insider, in an effort to fertilize them, but research in the 1990’s revealed the technique polluted the soil. Trash now litters the site — CityLab said abandoned sofas and cars are scattered in some areas. The plan to turn this wasteland into a forest isn’t a new one — it’s actually been around for 15 years, but has been mired in debates about the best use of the space. Now, according to City Lab, politicians from the area are throwing their weight behind the project. It could take 30 to 50 years for trees to reach maturity, according to Business Insider, but as they do the unofficial dump could experience renewal. SMAPP could create an equestrian center, observation decks, walking paths, and habitats for wildlife. 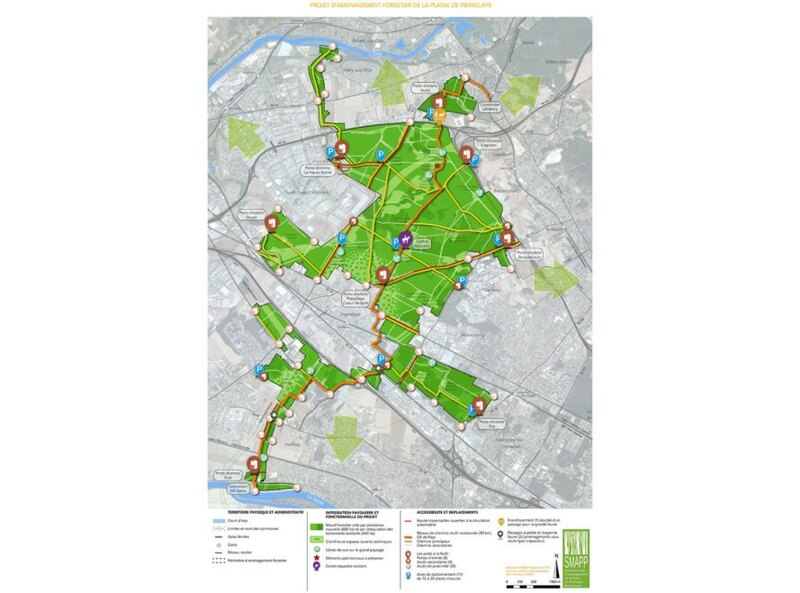 The SMAPP website says the 1,350 hectares could be comprised of 600 hectares of new forest, 370 hectares of restored forest (with invasive species thinned out), and 250 hectares of open spaces for the public or ecological reserves. CityLab pointed out the project still faces obstacles; there are around 1,500 squatter trailers in the area, as well as 4,000 parcels of privately owned land (exactly who owns them is unclear.) The SMAPP website lists two workshops in March that people can attend, and said consultation on the project will run until early April of this year. You can learn more about the project in this document from SMAPP or on their website. Paris could create a forest five times the size of Central Park in New York City. This is the map of proposed developments for the forest. The forest could include hiking trails and conservation areas.